Mil. Sta. No. 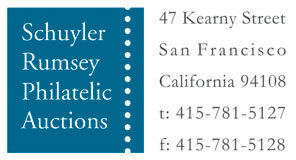 1, Philippine Isls, Registered. 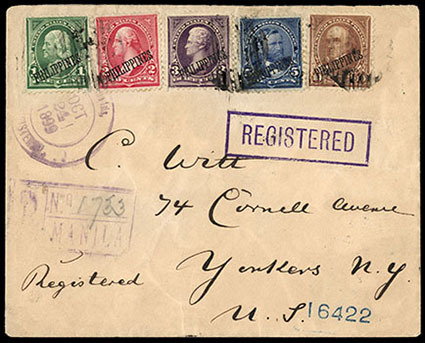 Oct 24, 1899, purple cds and matching grid cancels tie 1899, 1¢-10¢ Issue (214-217) on light buff cover to Yonkers N.Y., matching purple "R, Manila" framed registry handstamp, bold "Federico C. Schenkel, Manila" fancy backstamp and matching "Registered" framed handstamp, purple San Francisco (11.23) transit backstamp; couple small stamp flaws, Very Fine. Scott No. 214-217 Estimate $200 - 300. 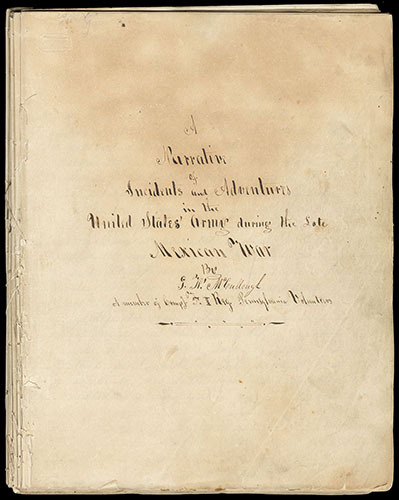 "Narrative of Incidents and Adventures in the United States' Army during the Late Mexican War by G.W. McCullough", 201 hand-written pages, noted as member of Company F, II Regiment, Pennsylvania Volunteers, preface indicates desire to give detailed accounts of his own observations while he was in the Division of the Army under command of Gen. W. Scott, extensive content includes landing at Vera Cruz on March 9th 1847: "…The first Division being safely landed, the boats were returned and filled with our Division, which was commanded by Genl. Patterson. By the time we had landed it was dark, and we were directed to lie down with our guns in our arms until morning…We slept as well as could be expected…when we were aroused from our slumbers by the firing of muskets. This proceeded from a small party of Mexicans, who fired on a few of our men who had gone out for water. They ran them into our pickets, who returned the fire, and soon silenced their guns…" and "…Nothing was heard but the roar of artillery, the crash of houses, the bursting of shells, and the shrieks of the dying. The whole scene was truly appalling to one who had never seen such a spectacle before." and then "…On the Morning of the 26th, the Mexicans sent out a flag of truce, when two of our officers were sent into the city to arrange the terms of Capitulation, which were agreed upon that day. These terms were in part that the Mexicans would have the privilege of saluting their flags when lowered…"; the narrative is very detailed and follows his journey throughout the war, Very Fine. AN IMPORTANT DETAILED MILITARY ACCOUNT OF THE SPANISH AMERICAN WAR.